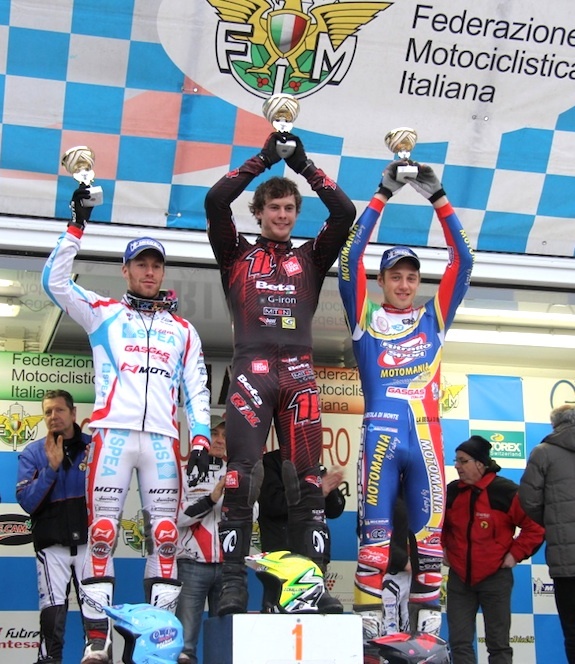 Top Trial Team’s Jack Challoner (Beta) took a convincing win yesterday at the opening round of the Italian outdoor Championship in Bosco Chiesanuova. Although the trial was on the easy side, Challoner kept his focus and took the win ahead of his challengers Matteo Grattarola and Luca Cotone. 2013 British Championship Round 1 Goes to Beta! Reigning British Trials Champion, James Dabill – Beta made a solid start to the defence of his title today, winning the opening round of the 2013 ACU British Solo Trials Championship, the Anthony Rew Trial hosted by West of England Motor Club at the Kelly Farm venue in Devon. Second place went to last year’s championship runner-up, Michael Brown – Gas Gas with Ross Danby – Jotagas claiming the remaining podium position. Run under no-stop rules for the second year and now in alignment with the rules used by the FIM for the World Outdoor Trials Championship, the defending champion didn’t get off to the best of starts, dropping his first five of the day on the second section of the opening lap. Not put off by this early error, a further dab on the fifth section followed by a score of two on the eleventh of twelve sections gave Dabill a score of just eight for his first lap. However, it was Brown who set the early standard dropping just two until he reached the final two sections where a three and a five in quick succession put him on an opening lap score of ten, two behind Dabill. Dabill’s second visit of the day was to prove his poorest performance. A three on the second section followed by two on the fourth, a dab on the eighth a five on the ninth which he’d ridden clean previously and another three on the eleventh gave him a lap score of fourteen and a total of twenty two. Brown matched the leader’s score on this lap, also finishing on fourteen putting him two points adrift going into the final third of the competition. Saving the best for last, the final lap saw Dabill shine. A single dab on the fourth section and a five on what was clearly a tough eleventh section left him with a lap score of just six and an overall score of twenty nine. Brown had no answer to this and successive fives on the eighth and ninth sections were to leave him no way back. He ended the day on a score of forty, eleven points behind the winner.